I am an artist, maker and civil engineer. The world is my stage and my family, my muses. I am the creator of PancakeBot, the LEGO SyrupBot and many other fun and strange projects. I live in Norway, love to make and invent, and play with my kids. On a cold winter night in Kongsberg Norway, dancers draped in white sheets stand in a warm auditorium waiting to hear their mark. As the mark arrives, each dancer hits a button and is instantly lit up with 136 RGB LEDs. The dancers move fluidly across the stage in sync with the music as the lights change colors to the beat and tone of the scene. The dance uses color to explore the topic of bullying, by representing emotions such as anxiety, love and anger. Jan Dyre Bjerknes and Mana Rambod, mentor and choreographer of the project, stand off stage watching the dancers move and keep track of the changes of the light. Everything goes dark for a second, the music and dancers stop, lights come up and it’s back to a bit more coding. The important thing here it that dancers can change color in a fraction of a second.’ Jan Dyre says. ‘ This allows us to play with the very notion of identity, consequently dissolving the very notion of identity. Very exciting stuff. To create the project, the 27 programming students and 15 costume designers from Kongsberg High School worked together. 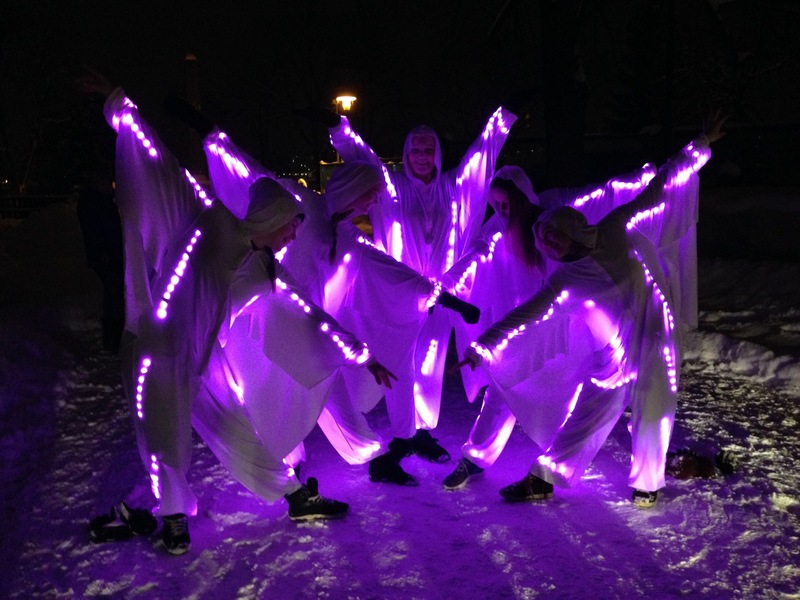 Students were broken up into several groups; one that determined the placement of the LED’s on the dancers, another group for programming, and another for hardware. An Adafruit Trinket Pro 3.3v handles the control and is powered by Eneloop batteries. Connectors and wire were sourced from Farnell. The first few weeks were spent learning basic electronics to better develop an understanding of voltage, current and resistance. Some students instantly gravitated to soldering and hardware while others dove into the programming. Using Arduino tutorials for the basics, they then used libraries to learn to control the Neopixels. For makers that wish to make a similar project, Jan Dyre will be finalizing documentation of all the projects that he has done through the Kongsberg Science Center and share it soon. Mana has taught Hip Hop and Funk by Studio 3 since 1996. She has a great passion for dance and has kept up to date by taking courses with national and international choreographers over the years. Mana has previously worked as a dancer and choreographer on Norwegian Broadcasting Company (NRK) Top 20. She can be contacted through the Studio3-dance.no website.